US Open doubles semifinalist Ashleigh Barty was awarded the women's 2018 US Open Sportsmanship Award. The award is presented to the professional tennis players who best demonstrate excellence in sportsmanship throughout the US Open Series and the US Open. John Isner won the men's award. "Very surprised, very humbling, I think," Barty said. "I always try to do my best on the court to compete and try the best that I can but, in the same breath, also have good sportsmanship and respect my opponent, respect the tournament and respect everything that goes on behind the scenes to make it a possibility." Eligibility requirements for winners include participating in at least two Series tournaments, as well as the 2018 US Open. Each US Open Sportsmanship Award winner receives a trophy and a $5,000 donation to the charity of his or her choice. The USTA Sportsmanship Award Selection Committee is comprised of USTA representatives, former players and journalists, including co-chairs Todd Martin and Lars Rosene, Jon Vegosen, Mary Carillo, Mary Joe Fernandez, Chanda Rubin, Joel Drucker, Steve Flink and Matt Cronin. 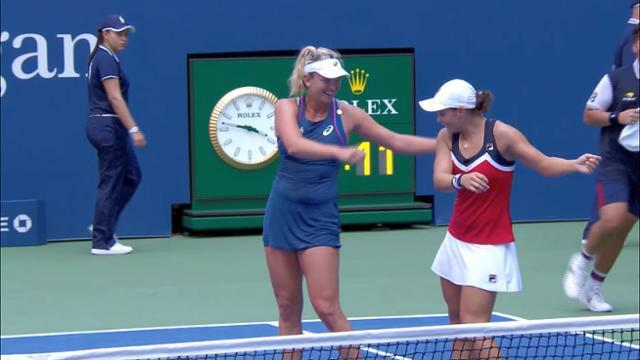 SEE ALSO: As the old saying goes, 'opposites attract'— and that couldn't be more true for Ashleigh Barty and CoCo Vandeweghe on the doubles court.